Powerful snowmaking systems have been leveraged during recent cold weather windows. Despite a disastrous November and December, four ski areas have been able to open 100% of their trailed terrain. In Connecticut, Mt. 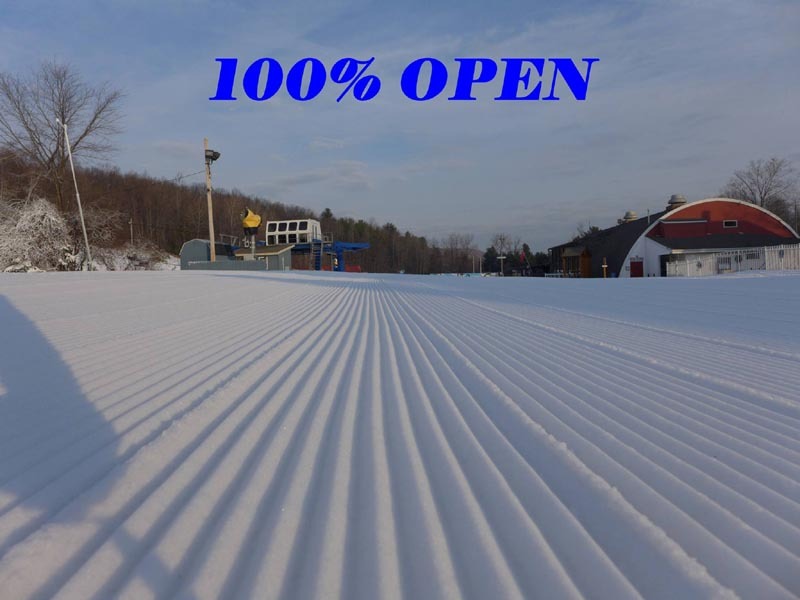 Southington and Ski Sundown both announced they were 100% open on Friday, January 15. Mt. Southington opened on January 5, while Sundown opened three days later. In New Hampshire, King Pine reached the 100% milestone on Saturday, January 16. Pats Peak achieved 100% today with the opening of Vortex. King Pine's season started on December 26, while Pats Peak's started on December 5. Sugarbush may be the first of the large resorts to reach 100%. While all 111 trails were scheduled to be open today, wind holds have resulted in most of the chairlifts being closed for the day. It is not known if they will be able to operate all trails and necessary lifts tomorrow.